BERLIN (Reuters) - German Chancellor Angela Merkel expressed readiness on Thursday to back a short extension to Britain's planned exit from the European Union, suggesting that the June 30 date requested by Prime Minister Theresa May was problematic. Addressing the German lower house before a summit of EU leaders, Merkel appeared to share concerns by the European Commission that May's proposed delay means Britain would still be an EU member during European Parliament elections in May. 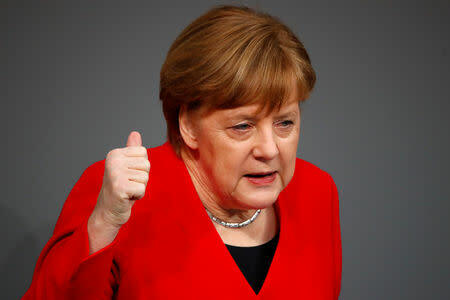 "With regard to the date of June 30, we have to take into consideration that we have European elections in May," Merkel said "This means the future and legality of the European election must be respected. But we can surely talk positively about a short extension." In her speech, Merkel echoed Tusk's position that it would be possible to grant Britain a short postponement if parliament backs May's proposed agreement next week, after voting it down twice before. Merkel said Germany would back May's request that EU leaders approve an agreement governing the Irish "backstop," which she described as the most difficult aspect of Brexit. "The second request was to delay the exit date to June 30. The leaders of the EU 27 will intensively discuss this request. In principal, we can meet this request if we have a positive vote in the British parliament next week about the exit document," Merkel said.